AS IT STANDS: Tell Me It Ain't So Pepe the Frog! I love frogs. My family nickname is "Frog." As a frog-lover who thinks Kermit the Frog should have run for president, I'm always looking out for frogs making headlines. You can imagine my dismay when I heard that cartoon character turned Internet meme, Pepe the Frog, has been added to the Anti-Defamation League's database of hate symbols! 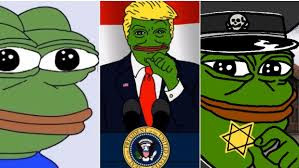 Pepe's good name was trampled on when websites 4chan, 8chan and Reddit spread his likeness around with memes promoting anti-Jewish, bigoted and offensive ideas. In recent months, Pepe has been almost entirely co-opted by the white supremacists who call themselves the "alt right." They dressed Pepe up with swastikas and other symbols of anti-semitism and white supremacy. I think it's pretty damn low to drag frogs into politics, especially politics of hate. Real frogs have more sense than to hang around politicians - it makes them uneasy that there's another species more slimey than them!